This past week, I had the honor of presenting a talk on PyCUDA at Nvidia‘s inaugural GPU Technology Conference. Please click the following link to view the slides: PyCUDA talk at Nvidia’s GPU Technology Conference. 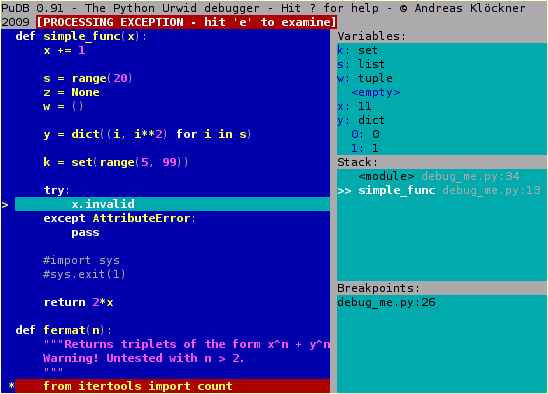 I’m happy to introduce PuDB, a full-screen, console-based visual debugger for Python that I recently cooked up. So after madman is currently orphaned in Debian and might get kicked out of the archive along with xmms kicking the bucket, I just noticed that one of my newer pieces of code made it into Debian: tagpy! :) That’s awesome.